The day after the new Miss World has been announced. Several reactions sprouted all across the globe many are happy but a few are disappointed. However, a comment from Devina Dediva angered the Filipino netizen. 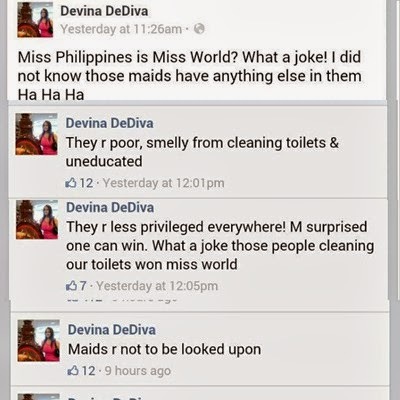 I have much to say about Miss Devina who apparently hate the Filipino people and calls them uneducated, smelly maids. Filipinos can go abroad and scrub toilets, take care of other children while leaving their child behind, wash clothes, do carpentry, works in a dirtiest places and most dangerous works anywhere in the world and take care of your oldies in the hope that they could send back home a penny for their child's education and a piece of cake and a glass of milk on their families table. And I think people like Devina should be thankful because at least there are someone taking care of the things they should be doing for their own family. Can you imagine Devina if there are no one who could wash your dishes, do your nail and hair care, take care of your kids and cook for your food. Will you see us (Filipinos) differently? I saw her post as well and took some screenshot in case she hides it. So I did checked her profile and she claims from Manchester University. However the said University denies her being a student of Manchester University. She then changed her facebook profile name after a few days. I would like to challenge Devina to look around her, coffee shop, hospitals, home for the aged, government offices, banks, airports, ships, and houses, etc... I bet there will always be a Filipino working there. Filipino's work all across the globe again to have a piece of cheese and a bottle of milk on the table and of course for their child's education. We work hard and we dont care if by the end of the day we end up smelly on your nose for as long as we work hard to provide for our own family.